WASHINGTON – A high-tech entrepreneur unveiled plans Tuesday to launch the world’s most powerful rocket since man went to the moon. Space Exploration Technology has already sent the first private rocket and capsule into Earth’s orbit as a commercial venture. It is now planning a rocket that could lift twice as much cargo into orbit as the soon-to-be-retired space shuttle. The first launch is slotted for 2013 from California with follow-up launches from Cape Canaveral in Florida. Space X’s new rocket called Falcon Heavy is big enough to send cargo or even people out of Earth’s orbit to the moon, an asteroid or Mars. Only the long retired Saturn V rocket that sent men to the moon was bigger. “This is a rocket of truly huge scale,” said Space X president Elon Musk, who also founded PayPal and manufactures electric sports cars. The Falcon Heavy could put 117,000 pounds into the same orbit as the International Space Station. The space shuttle hauls about 54,000 pounds into orbit. The old Saturn V could carry more than 400,000 pounds of cargo. The old Soviet Union had a giant moon rocket bigger than the Falcon Heavy, but it failed in all four launch attempts. Another Soviet rocket, also bigger than Falcon Heavy and designed to launch its version of the space shuttle, had one successful flight more than 20 years ago. While the new Space X rocket is designed initially for cargo, it satisfies NASA’s current safety requirements for carrying humans and after several launches could carry people too, Musk said. He has said that if NASA does buy rides on commercial rockets, he would be able to fly astronauts to the space station in his smaller Falcon 9 rocket and Dragon capsule within three years. Potential customers for the new larger rocket are NASA, the military, other governments and satellite makers. Musk said Falcon Heavy will be far cheaper than government or private rockets. Launches are about $100 million each. He said the Air Force pays two older more established aerospace firms about $435 million for each of its launches. Over its 40 year design history, the space shuttle program has cost about $1.5 billion per launch, according to a study by the University of Colorado and an Associated Press analysis of NASA budgets. 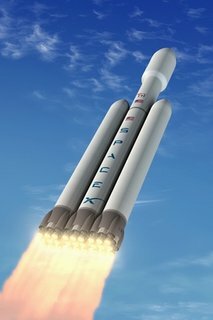 To get costs that low, Musk said he needs to launch about four Falcon Heavy rockets a year but plans on launching about 10. He doesn’t have a paying customer for his first launch, but is in negotiations with NASA and other customers for flights after his company proves the new rocket flies. Lambright said companies have often made big claims about private space without doing much. But, he added, Musk has some credibility because of his successful Falcon 9. If Musk’s plans work, it will give President Barack Obama’s space policy a needed boost, Lambright said. Obama has been battling some in Congress over his plans to use more private space companies, like Space X, for getting people to orbit with NASA concentrating on missions to send astronauts to new places, such as nearby asteroids. Several companies are vying to launch private rockets that could replace the shuttle. NASA is now paying Russia to send astronauts to and from the space station on Soyuz spacecraft.